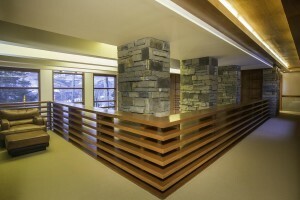 This outstanding, timelessly-designed home is situated on a prime ski-in/out lot with every premium quality one could ask for – spectacular mountain views to both the Sneffels Range and Wilson Peak, privacy at the end of a cul-de-sac bordering many acres of open space, location lower down the mountain relatively close to the Core, and seamless ski access. 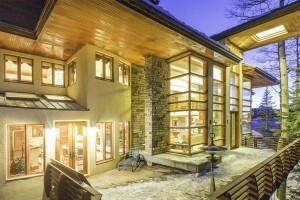 With many unique architectural features fashioned after “Wrightean” elements, this comfortable home was meticulously built with high quality craftsmanship and the best materials. The timeless “Wrightean” architectural aspects of “Halcyon West” include sizable cantilevered roof sections, giving the home a strong and stately presence. 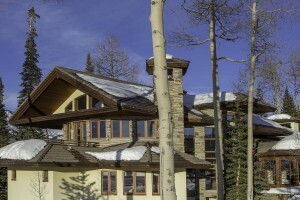 With true seamless ski access, this home is ideal for a rich family and social life for people who live an active lifestyle. “Halcyon West” simply radiates quality, timeless design, and everything long lasting. 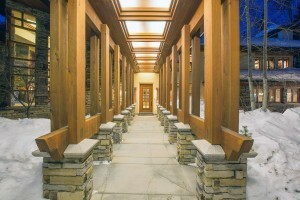 Stunning Porte Cochere allows for elegant arrival of your guests. The large private driveway next to the Porte Cochere allows for carefree entry to the home and easy access to the 3-car garage. 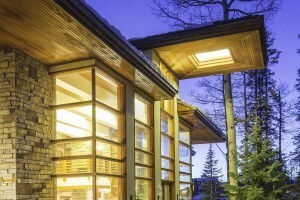 Stunning interior and exterior lighting creates a natural flow into and throughout the home. 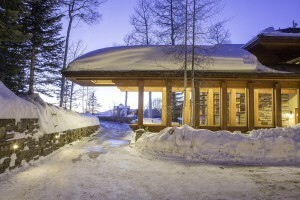 As an architectural masterpiece on a platinum lot, this ski home is ideal for sophisticated home owners who appreciate refined quality and attention to detail. 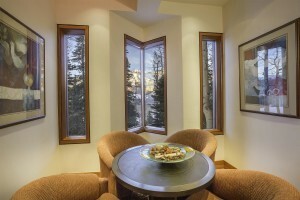 With a huge vaulted ceiling and 25 foot high windows the dramatic and spacious great room has open views of the surrounding mountains, lots of sun, and direct access to the outdoor deck and gazebo. This view from above the great room brings attention to the spacious living, area and accentuates the impeccable interior design detail. 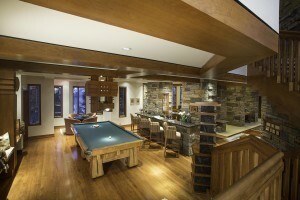 Enjoy the spacious pool table and wet bar area with friends and family. 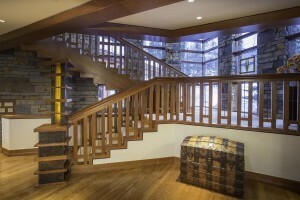 Quality craftsmanship is reflected in the beautiful millwork array with prime cherry wood finely finished for the floors and trim work, for the polished stairway railings, for the wood sconces, and for the intricate patterns in relief of the wood paneling. 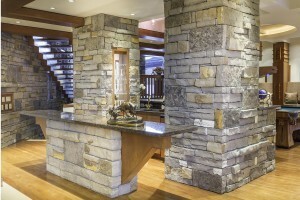 This beautiful stone wet bar demonstrates the quality of the stone workmanship and great attention to craftmanship detail. Baldwin hardware for all the doors and the fact that the house was framed in steel instead of wood. It is rock-solid and enduring. 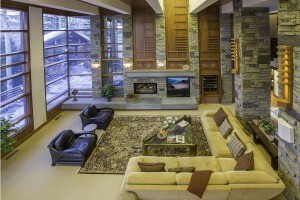 Spacious seating area adjacent to the bar and pool table. 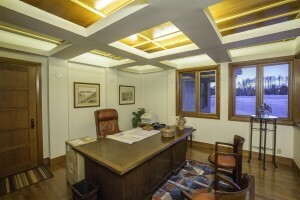 Large private office with custom ceiling and lighting, and plenty of natural sunlight. 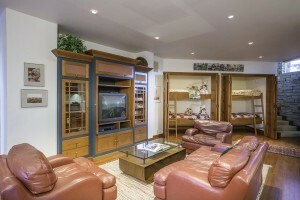 Media room/second living room with recessed bunk beds for kid sleepovers. 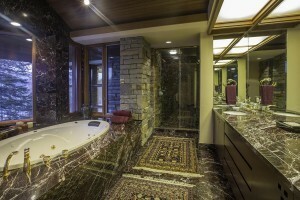 Gold plated Dornbracht plumbing fixtures throughout the house are of the highest quality and demonstrate how no expense was spared in construction. Spacious Master Bedroom with Curved Ceiling & Finely Detailed Wood Finishes. 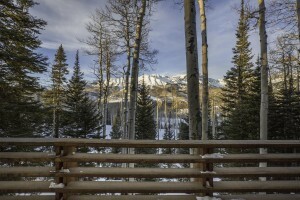 Mountain views and sunshine fill the ambience of the master bedroom. Elegant master bath with classic Rosso Levanto marble, jetted tub, steam shower, gold plated Dornbracht plumbing fixtures, and beautiful Outdoor Views. 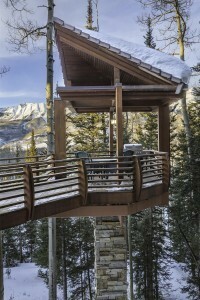 Stunning gazebo off the main deck, 30′ above the ground and bounded by a grove of fir trees, with snowshed roof, and breathtaking views of the Wilson peaks. 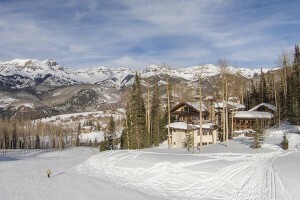 Spectacular mountain views to both the Sneffels Range and Wilson Peak. This view of the great room from the balcony accentuates how well this home is designed for privacy and a rich family and social life.